Is homework a good idea or not? Homework debate: What's the issue? Going to school - means lessons, assembly, seeing your friends and - for a lot of you - time to do homework! While giving homework to pupils in secondary schools is generally seen as a good idea, some don't think that kids in primary schools should have to do it. What do you think of homework? For the last 100 years or so, experts have been trying to work out if it is beneficial to give homework to kids in primary schools. In the UK, the government says it's up to the head teacher to decide whether or not their school will set extra work like this. Find out more about both sides of the argument with Newsround's guide, and then let us know what you think of doing homework when you're in primary school. Homework generally means work that is set by teachers for you to do outside of your normal school hours. When you're younger, your parents might help you to do it. But as you get older, you will generally take more responsibility for doing your homework on your own. Professor Sue Hallam from the Institute of Education - who is one of the most experienced researchers into homework in the UK - says that in 1997, just over 6 in every 10 primary schools made their pupils do homework. Just two years later, this had risen to around nine in ten primary schools and the majority still set homework now. Why do people think homework is a good idea? Many think that giving homework to primary school children is an important part of their learning. They believe it helps them to practice what that they have learnt in lessons, in order to get better at things like spelling and handwriting. They say it helps to teach children how to work on their own and be disciplined with themselves - both skills that are useful later in life. It can also allow parents or guardians to get involved in their children's learning. To find out more about why people think homework is a good idea, Jenny spoke to Chris from the campaign for Real Education, which is a group of teachers and parents who care about how well schools are doing. Members of the organisation believe that traditional homework is important. Chris told Newsround: "If you like learning, homework helps to support your learning. It's really important to go back afterwards and think about what you're learning in class. Practice makes perfect." What are the arguments for homework? 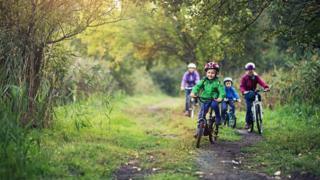 "In parts of the world, children are doing much better in school than children in the UK. In most cases, they are doing much more homework. "That doesn't mean you should be doing home work all the time. "But a little bit of homework to support what you're doing in the classroom, involving your parents and guardians, is really good because it allows you to do as well as everybody else in the world." Chris added that it is important to have a balance between homework and other activities. "Homework shouldn't be overdone. Let's do some homework and some play." Why do people think homework is a bad idea? Some people think that giving homework to children at primary school is not necessary. They think it puts too much pressure on them and that the time spent doing homework could be used to do other activities. Jenny also spoke to Nansi Ellis - assistant general secretary of one of the biggest teacher's unions in England, made up of teachers and heads - who doesn't believe that giving homework to primary school children is needed. She told Newsround: "There is other good stuff you can do at home, like reading, playing sport or a musical instrument, or helping with the cooking, shopping or with your siblings. You might be a Guide or a Scout. "Those things are really helpful for you to learn to work in a team, to learn to be creative, to ask questions and to help other people. These are really important skills. "The trouble with homework is that it gets in the way of all of those good things that you could be doing and it doesn't necessarily help you with your school work." Sometimes parents or guardians try to help with homework and, if they have been taught differently, it can end up being confusing for the child doing the homework. They can also end up doing too much of the work themselves! Nansi explained that it's important parents don't do your homework themselves! Nansi added: "Some children live in really busy houses with lots of people coming and going, and they don't have a quiet space to do homework, so they can't use it to help them to get better at studying on their own, which doesn't seem fair. "Teachers set homework for you to get better at your learning - that seems like a really good reason. But actually, the evidence isn't clear that even that's true." Another expert Rosamund McNeil, from a teachers' organisation called the NUT, said: "Pupils in Finland are assigned very little homework yet they remain one of the most educationally successful countries in the world." Why is this issue being talked about? People have been trying to find out if homework is a good thing or a bad thing for many years. Recently, a report was done by an organisation called the Teaching Schools Council, which works with the government and schools in England. It says: "Homework [in primary schools] should have a clear purpose." 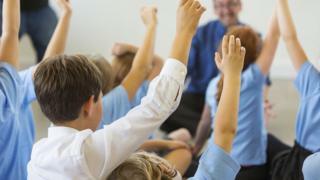 Should primary schools set homework? Dame Reena Keeble, an ex-primary school head teacher who led the report, told Newsround: "What we are saying in our report is that if schools are setting homework for you, they need to explain to you - and your mums and dads - why they're setting it, and your teachers need to let you know how you've done in your homework. "We found homework can really help with your learning, as long as your school makes sure that what you're doing for your homework is making a difference." So is homework a good idea or a bad idea? Many people have different opinions. However, the truth is it's hard to know. Professor Hallam explains that part of the problem is that it is difficult to accurately work out how useful homework is. Generally, people agree that homework is good idea for children in secondary school. But for primary school, it isn't clear if there's a right or wrong answer to this question. And you've been having your say too. Nearly 900 of you took part in an online vote about the amount of homework you get: whether it is not enough, just right or too much. 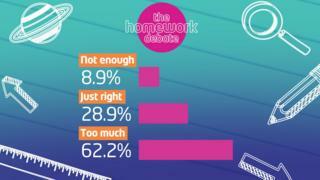 The Homework Debate: How would you change homework? Do you think you get set too much homework? Should homework be done at school?